The 7-Mountains and 4-Mountains Hike, Sunday 26th of May 2019. 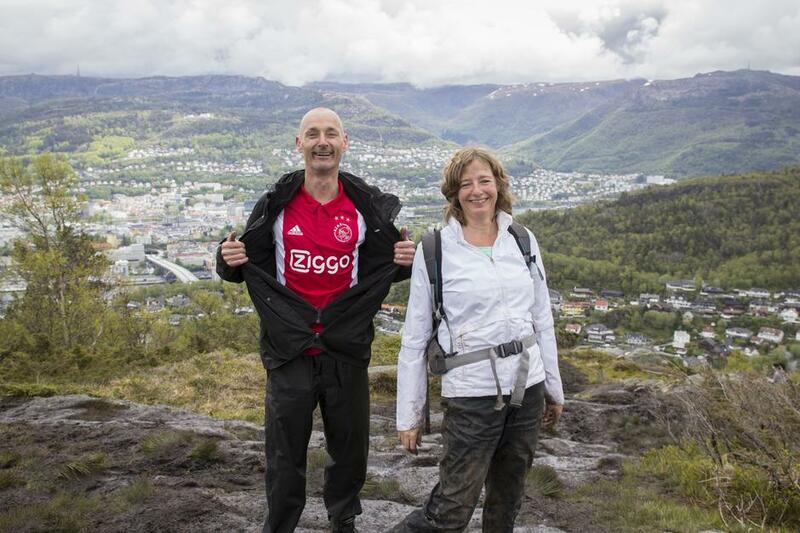 Bergen Trekking Association invites you to take part in The 7-Mountains or 4-Mountains Hike. An unforgettable introduction to the Norwegian's love for outdoors recreation and hiking tradition. If you love walking and hiking and would like to experience Bergen, the fjords and the west coast of Norway from the bird's eye view, then participating in this trekking adventure might be Your cup of tea. The 7-Mountains and 4-Mountains Hike is an annual event and has become an attraction and a mass movement. About 8000 participants takes part in this one day organised hike over the 7- or 4- mountain tops of Bergen. You can finnish the hike in Your own pace as no time are registered. You may spend the whole Sunday to get thorugh the approximately 35 kilometres of the marked trail, which involves a total ascent of 2,300 metres. Yes, it is a test piece of strength and stamina, but also an unforgettable experience you will share with other committed hikers of all ages. Watch the 7-Mountains Hike Movie and get inspired to participate! You need to be in good physical condition to Complete the 7-Mountains Hike. If you keep fit through regular walks and hikes, you should be able to complete the hike without any greater problems, other than stiff legs the day after completion :-) The hike was organised for the first time in 1948. The last few years it has experienced a renessance With increasing numbers of participants. It is the greatest hiking event in Norway. A snack and fruit juice will be served free of charge at Årstad upper secondary school. Fruit juice will also be served between Mount Fløyen and Rundemannen. It is intrinsic that you bring enough Food and water/drink for an all-day walk. Something warm to drink may also give som energy along the way. The 7-Mountains Hike starts at Gravdal (beside Nutec) between 6.30 a.m. and 9 a.m. The Whole route is well marked and proceeds up to the top of Lyderhorn at 396 metres above sea Level, then onwards to the top of Damsgårdsfjellet (elevation 350 m), the top of Løvstakken (elevation 477 m), the top of mount Ulriken (elevation at 640 m), the Mount Fløyen (elevation 400 m), the Brushytten kiosk and Rundemannen (elevation 560 m), and the last of the 7-mountains is Sandviksfjellet at 417 meters above sea Level. From her on downwards and back to the Bergen Trekking Association's Headquarter in Marken (Tverrgaten 4 - 6) in the city centre. See topographic view of the trail.Participants' registration card must be punched at all summits and handed in to the secretariat in Marken when finnished. In return you will receive a T-shirt and a diploma to show all Your friends what a fit and happy rambler you are! Buses will depart from Nygaten near Bergen Trekking Associtaion's Headquarters in Tverrgaten 4 - 6 to Gravdal. The buses starts running from 06.15 a.m. until 8.30 a.m. The bus ride is free. It is not possible to embark en route. It is important to notify the organisers if you are not able to finnish the hike. Tell one of the stewards and hand in your registration card. The organiser accepts no responsibility for participants who leave the track. It is advised not to start on the ascent of Mount Ulriken after 4 p.m. The Bergen branch of the amateur radio association Norsk Radio Relæliga has communications stations on all the summits as well as at the finishing point. They are in continuous contact with The Bergen Trekking Association. There are Red Cross personnel stationed several places along the track to attend to the participants safety. A backtroop follows behind the participants to make sure no one are left behind and all participants get thorugh, or are taken care of. Therefore stay on the marked trail, rather then leaving, if you need assistance. On completin all participants receives a diploma and a T-shirt to show all Your friends that you are a fit, committed and happy rambler. If you are over 65 years of ages or below 12 years of age, the 4-mountains hike counts as a 7-mountains hike towards plaques and statuettes. If you are entitled to one of the above trophies, ask for the special form on finishing the hike. Hand in the completed form to our secretariat. Your trophy will be presented at the Association's members' meeting in the autumn. This hike is intended for everyone who finds The 7-Mountains Hike too long. The 4-Mountains Hike starts at Årstad Upper Secondary School at Danmarksplass between 7 and 10 a.m. The route is Mount Ulriken, Mount Fløyen, Rundemannen, Sandviksfjellet, finishing at The Bergen Trekking Association's Headquarters in Tverrgaten 4 - 6, Marken. On completion all participants receive a diploma, a badge and a nice T-shirt. See the programme for The 7-Mountains Hike. Prices: see above. Everyone who completes the hike gets a diploma and a nice T-shirt to show of their great adventure.